Evangelist Shenita Lloyd will be delivering a powerful word from God. Evangelist Lloyd is native of Detroit, MI as well as the wife of the anointed Bishop Eric Lloyd. 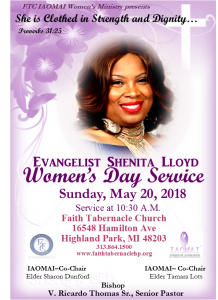 She is the first Lady of Rhema International Church in Harper Woods, MI and a devoted and nurturing mother of five beautiful children.